Vogue dining chair is upholstered in patterned beige velvet sit cushion with a white lacquer wood back finished in high gloss clear lacquer. Vogue dining chair by Roberto Grassie is upholstered in patterned beige velvet sit cushion with a white lacquer wood back finished in high gloss clear lacquer. Levine glam dining chair has a champagne painted steel base, with abstract cut-out pattern backrest and taupe faux leather upholstery. Available in Taupe, Beige and White colors. 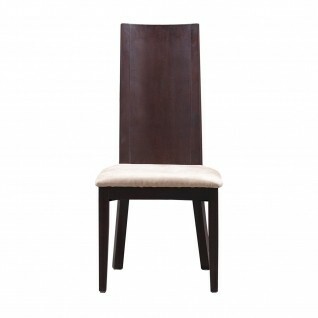 Leonis modern dining chair features brushed stainless steel base and comfortable seat with black microfiber upholstery. Available in Black, Gray, Mocha and Cream colors. 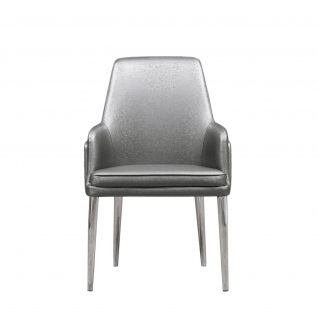 Vitali stylish luxury dining chair features a quilted gray faux leather upholstery with silver polished stainless steel legs.